This Le Creuset 3 1/2-qt. 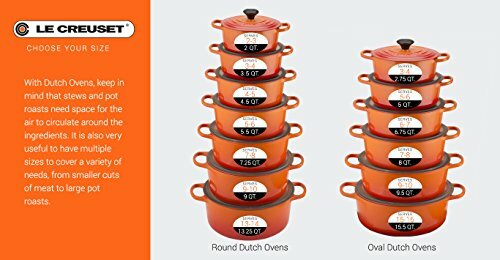 oval French oven provides the exceptional consistent heat temperature to braise rub-crusted tenderloin, beef ribs or add a delicious golden crispness to casseroles or cobblers. Preferred by chefs for the cooking versatility, superior heat retention and excellent browning of foods, Le Creuset enameled cast-iron cookware ensures ingredients cook at an even temperature. With the high-quality porcelain-enamel coating, this oval French oven is impermeable to odors and stains for lifetime use. 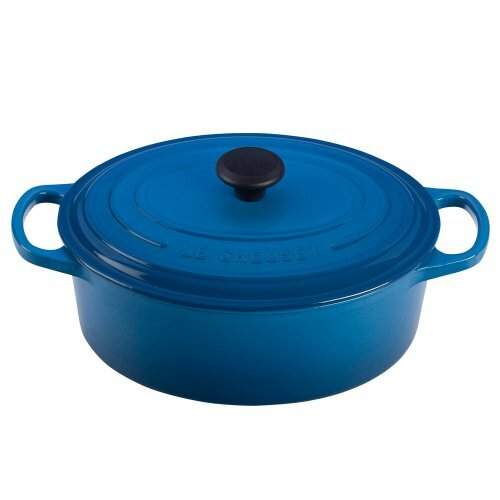 The Le Creuset Signature collection combines traditional superior craftsmanship with ergonomic and functional innovations. Modernized lid is more stable and tight-fitting, ensuring better performance sealing in moisture and flavors. The handles on this 3 1/2-qt. French oven are 45% larger, providing a roomier grip to lift with oven mitts. Improved ergonomic knob is heat-resistant to 500 F. This Signature collection features the most durable and resistant interior formulation offered by Le Creuset, smooth and easy to clean, with the even heating performance to braise meat or seafood, or add a golden crispness to casseroles and desserts. Food or liquid will not react with the enameled finish. With the tight-fitting lid, moisture is sealed inside for best absorption of seasonings and flavor. This 3 1/2-qt. oval French oven goes from fridge or freezer to the oven or stove top, then conveniently to the table for beautiful presentation. Oven-, broiler-, freezer- and dishwasher-safe. Made in France. Lifetime manufacturer warranty. Le Creuset is consistently chosen by leading chefs, restaurateurs and home connoisseurs for its cooking advantages, performance and style. Bright color choices are the legendary style at Le Creuset to enliven your world of serving and entertaining. The best gourmet meals deserve the cooking finesse of Le Creuset.